Wild flowers were in full bloom everywhere as Ginny and I arrived in Italy this May. Our initial days were slow paced, enjoying the beautiful countryside, fresh ricotta, and local wine (Cassavechia) provided by the gracious Lombardi family at Le Campestre, in Castel di Sasso. We met the owners of Terre Principe, Manuella Pieancastelli and Pepe Mancini, from whom we buy wine at Franco Pepe’s Antica Osteria Pizzeria in Caiazzo for dinner. Franco’s crust is a work of art. On a day trip, we ate warm bufala mozzarella fresh from its bath at Caseificio il Casolare in Alvignano. We toured La Reggia in nearby Casserta, the royal palace of the Bourbon King, Charles the Third. The palace dates back to the mid 1700’s and its splendor rivals Versailles in France. From the palace in Caserta one can take a 3 km walk along gently inclining formal pools. This passeggiata leads to a natural mountain waterfall that feeds the pools, which at its base is surrounded by sculptural fountains and lovely gardens. In Napoli, we took an archeological and historical tour led by Domenico Mazzella, whom we have known for several years by way of his fabulous and centrally located B & B, Donna Regina. Domenico’s knowledge of art, architecture, archeology, philosophy, food, and wine is second to none. His B & B is filled with 20th century Neapolitan art, books, furnishings, and each room is uniquely designed. The breakfast area looks onto a little school where you can hear the children sing and watch them at their morning lessons. Thanks again to Arthur Schwartz, the Food Maven, for telling us about Donna Regina when we were together at Tenuta Seliano in Paestum several years ago. For information on Arthur’s and Baronessa Cecilia Bellelli Barlatta’s cooking classes go to www.agriturismoseliano.it. For a great local meal, try Osteria Pisano near the Duomo in Naples. While I had a few specific pizza plans for this trip, a surprise encounter with Antimo Caputo at Antonio Starita’s pizzeria in Martedei upped the ante. I called Antimo just to say hello; twenty minutes later he zipped over on his motorino to make a special offer involving a very important food event. Organized by celebrated chef Gennaro Esposito, whose Terre del Saracino in Vico Equenze is famous for its outstanding cuisine, his Festa a Vico has been drawing international attention for several years. Antimo’s invitation was for me to participate on the final day of the event for “La Pizza centimitro per centimitro, La Tradizione molecola a molecola.” Following the “90-starred chefs, 80 emerging chefs, 10,000 samples of signature cuisine, 200 wines,” the third day’s focus would be pizza and its craft. Without learning any more detail, I agreed! We all felt it would be a great opportunity--for all of us! We said goodbye to Antimo. Next stop: Palinuro in the Cilento. I was excited to show Ginny (my wife and co-owner of Spacca Napoli) the Cilento. With Domenico’s house in Palinuro as a base, we shared its beautiful, magical mix of sea, mountains and valleys. Seafood, handmade pastas, grilled meats, local grains, vegetables and fruits, herbal digestivi, wild flowers, intimate towns, abandoned medieval villages, caves along the coast and its interiors, powerful storms, musica folklore; we drank in its many pleasures. (photos from Pranzo al villa balbi). While dining with Cono at his agriturismo, we came up with a brilliant idea: to arrange a meeting between Cono to Liliana at Le Campestre. Cono and the Lombardi family are cut from the same cloth. Their celebration of the earth and its bounty and their joy in sharing it is inspiring. After seeing images of Le Campestre, Cono, a fellow shepherd and cheese maker, was game. Liliana was also interested. Ginny has worked with a particular artistic form for several years while traveling. Its actualization in various landscape settings uses stones, driftwood, leaf matter, and spices. Ginny made one on the beach at Palinuro, using detritus washed ashore, in homage to Joseph Beuys, while I filmed the process. Some of you who know Spacca may still not know that it was because of Ginny and her art that we lived in Italy. Ginny painted in Florence, I was a casalingo (househusband). Our daughter Sarah was our passport to good will. The years in Florence and the Gargano introduced us to a way of being and living, the generosity and kindness of which we have never forgotten. (Photos of pranzo al Palinuro) My mission is to offer it at Spacca Napoli, sharing it with my staff and the community, near and far, who supports us. Watch She Wants to Know from Ginny Sykes on Vimeo. In Palinuro we visited with another fantastic artisan! Franco Fucciolo has Pizzeria Med Farine Club, and is it worth the trip! We ate, and I made pizza with him. Each person brings their own approach to the craft of dough making, so each encounter is an opportunity to learn. In Naples, Ginny made a ceramic relief sculpture. Domenico’s cousin, Laura has a studio near the B & B. Being with Laura and her two colleagues was a highlight. After a little more time in Naples, we went to the Island of Capri where we hiked, watched sunsets, and ate more great fish at Il Cucciolo and Ristorante Lido del Faro. In the town of Anacapri is the lovely Chiesa San Michele built in 1719. Its stunning floor is made of hundreds of individually painted ceramic tiles. It is similar to the Cathedral in Otranto in Puglia. The theme of both is the Garden of Eden and the tree of life. Back in Rome: with friends we took a misty four hour walk along the old Appian Way. Via Appia was constructed in the third century, connects Rome to Brindisi, and was the world’s first highway. It is evocative, alive with ruins, villas, and archeological sites. In Rome we tried this fantastic gelateria called Giolitti, which dates back to 1900. Gabriele Bonci’s Pizzarium is not to be missed. He is a master baker and pizza maker. Known in Rome as the Michelangelo of Pizza, his style is known as pizza al taglio. Using the finest ingredients, his dough sometimes incorporates a sour dough starter said to date back to World War One. Impressive. He believes a pizza maker needs to start off under the tutelage of a baker; by learning how to make all types of bread and pastry, one is in a better position to decide which direction to take as a pizza maker. Gabrielle offers a class on bread making which I will take someday. Ginny returned to Chicago, I to Naples for an interview with Professor Paolo Masi, Department Chair of the School of Agriculture, University of Naples, who is doing research on the science of flour. Just a few days before Ginny’s departure, I learned what the focus would be in Vico Equenze on the third day of the Festa A Vico: the art and science of pizza’s impasto (dough). Most people who eat pizza might think about its merits, but some of us truly get into the minutia of it. We wonder how the dough is made, how it is extended, how it is baked, how it performs, how it tastes, how digestible it is. This passionate obsession would fill the day’s event. Gennaro Esposito, with Molino Caputo and the University of Napoli “Frederico 11” created a program including six well-known and respected pizzaiuoli from Napoli and two stranieri (foreigners). The stranieri: Pasquale Makishima, Japan; and me--Jonathan Goldsmith, USA. After the interview with Professor Masi at Molino Caputo, we went to Pizzeria Salvo in Portici, just outside of Naples. Salvatore Salvo, along with Salvatore Di Mattteo, Attilio Bachetti, Gino Sorbillo, Maria Cacialli, Raimondo La Mura and Pasquale Makishima, would also be interviewed. I have great respect for Salvatore and the pizza at Pizzeria Salvo. Its unique quality reminds me of the masterpieces Franco Pepe creates in Caiazzo. It is interesting to note that both he and Franco Pepe have wood burning ovens built by the same artisan, Stefano Ferrara. I now had four days to myself before the event. By late evening, I was in Rodi. Sparta and Giovanni knew I was coming; the rest of the family did not. I have a habit of making surprise visits. My only agenda was to visit with the Albanos, enjoy the sunrise and sunset, early morning birds, some cacciocavallo cheese and a goccio or two of red wine. After an early morning drive through Taurasi, Irpinia and Solopaca, I met up with Domenico and Cono in Caiazzo. We visited Franco Pepe at his new pizzeria, still under construction. There is always time for café and conversation. Cono held court, far from the Cilento. It was great! He and Franco discussed bread making as it was done years past and in previous generations. I could see that Cono was doing OK, accordion in hand and that this trip was already worthwhile. At Le Campestre, everyone shared an afternoon of music, dance, food and wine. I documented this historic dialogue. Cheese, wine, grain, fruits, goats, sheep, memories past, new friendships, laughter, what more can you ask? (More videos from this trip). Late Monday, Naples. For the event Wednesday, not only did I have to demonstrate my method of making dough, I had to make a Margherita pizza with it and present it alongside the masters from Naples and Pasquale Makishima of Japan. Though nervous, I was excited. With fresh whites and sneakers I arrived early a.m. Tuesday at pizzeria Di Matteo on Via Tribunale. Where better to make my dough? I planned to make a double rise, put it in the fridge, then bring it to temperatura ambiente (room temperature) for the following day. When I returned to Di Matteo that afternoon to form the pagnotti (dough balls), I was not certain I had judged accurately the existing temperature and humidity. Catching the dough on the rise is important. If it begins to descend, you have a problem. Though one of the veteran pizzaiuoli assured me that all was ok, I had my doubts. 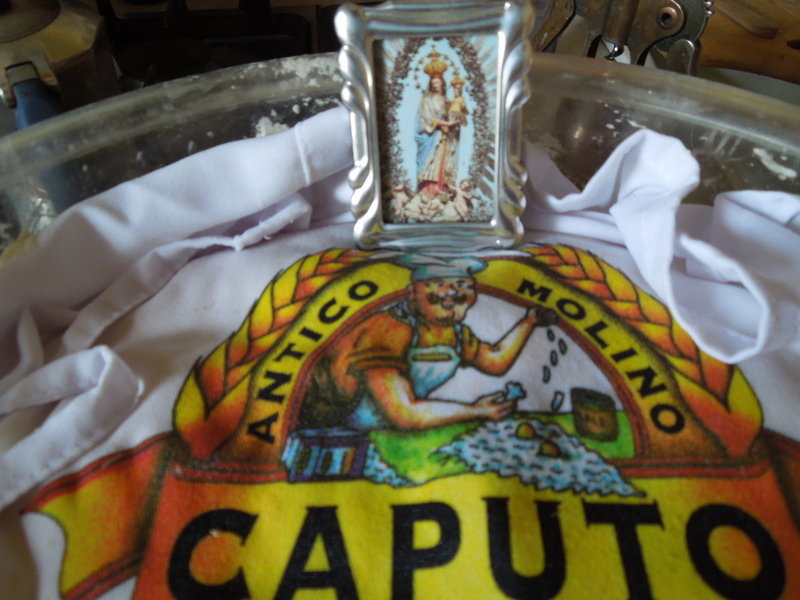 At Molino Caputo that evening I asked for a bag of flour. We were on our way to Vico Equenze for a gala fundraiser on the beach. All the chefs were there, each presenting a special dish. With Vesuvio in the background, it was quite a night. Along with the flour, I had Domenico pick up a few grams of yeast from Di Matteo. I returned to Donna Regina soon after midnight and immediately began to measure out the flour on the tiniest of scales and mix the dough by hand . Though exhausted by the time I went to sleep, I now felt ready for the next day. After introductions and academic presentations by Sig. La Maura (il padrone, Pizza A Metro, Vico Equenze), Gennaro Esposito, Antimo Caputo and Professors Paolo Masi and Luca Scalfi, we went to work. Esteemed members of the pizza community, assorted friends and an array of journalists were there. Along with the classic “Pizza Margherita”, “Pizza a Metro” and “Pizza Fritta” were presented. I was third in line, preceded by Attilio Bachetti and Salvatore Di Matteo; some act to follow. Gennaro was very kind, he checked in every once in a while to see if I was ok. Fortunately, all went well. My pizza looked good and I made a coherent presentation. I have no doubt that all I have learned and experienced during my studies, observations, trials and errors, relationships with other pizza makers, and years thus far at Spacca Napoli came together in this event. To me, that’s the beauty of how the past and present come together every time in pizza.